Libraries play an ever important and expanding role in the lives of Minnesota citizens. Minnesota's rare and unique collaboration of all types of libraries -- county, K-12 school, state, academic and special libraries -- reach every corner and community in the state. Here are some highlights of the public library resources available to Minnesotans. Minnesota's Minitex program is a publicly supported network of academic, public, state government, and special libraries working cooperatively to improve library service for users in Minnesota, North Dakota and South Dakota and reciprocity with Wisconsin libraries. The Minitex program is funded by the Minnesota Legislature as a joint program of the Minnesota Office of Higher Education and the University of Minnesota. Minitex's Fiscal Year 2017 state appropriation was $5.9 million and over 942,000 items were shipped for libraries in the region last year. While Minitex has been in operation for over 48 years the programs it helps support are expanding. MNLINK is available to all Minnesotans who are registered users of a participating library. Last year over 517,509 requests were received to share resources; 109,000 were filled from the University of Minnesota collection; and 68,000 articles were delivered electronically to users. The Minnesota Digital Library supports discovery and education through access to unique digital collections shared by cultural heritage organizations from across the state. Contributors include libraries, historical societies, museums, and archives. The Minnesota Digital Library also provides education and training opportunities concerning digitization best practices, metadata for digital collections, and digital preservation. Minnesota Reflections, begun in 2003, includes digital content from 190 participating organizations depicting the history of Minnesota from across the state. More than 54,000 photographs, postcards, maps, documents, letters, and oral histories have been digitized. These materials are available online in a free searchable database. Ebooks Minnesota is an online ebook collection for all Minnesotans. The collection covers a wide variety of subjects for readers of all ages, and features content from Minnesota independent publishers, including some of the state's best literature and nonfiction. There are 4,100 titles in the collection with over 66,000 requests filled last year. Open-access textbooks are being added and collections are expanding to include books in Spanish, Somali and Karen languages. Minnesota's Immigrants is a collaborative project with the Minnesota Digital Library (MDL) and the Digital Public Library of America (DPLA). Cultural organizations throughout the state capture and expose the myriad stories of the citizens who make up this great state and call Minnesota home. Minnesota has a long tradition of immigration to the state. The Ojibwe and Dakota people, the largest American Indian tribes living in Minnesota in the early and mid-19th century, were joined by an influx of European émigrés settling in Minnesota in the 19th and early 20th centuries. Immigration continues today, more recently with the Hmong, Somali, Korean, and Latino entrants to the state. The digitized oral histories from organizations across the state have been coupled with newly created stories to document Minnesota's rich immigrant traditions. This project weaves together these audio and video histories into a single space where these stories can be gathered, saved, and shared in an openly and freely accessible manner. In sharing these immigrant stories, told through their own voices, this project shares with the world a broader view of what it means to be Minnesotan. Another new initiative coordinated by Minitex and Minnesota's academic and public libraries is the Minnesota Libraries Publishing Project, proving that libraries have a role to play in self-publishing. This pilot project provides online publishing tools via Pressbooks and training information to support independent authors and small publishers. Its goal is to encourage conversation among Minnesota libraries about and promote experimentation with open- and self-publishing. 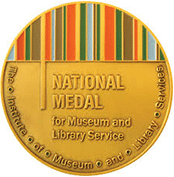 The University of Minnesota Libraries was one of ten national recipients of the 2017 National Medal for Museum and Library Service. This award is the nation's highest honor given to museums and libraries for service to the community awarded by The Institute of Museum and Library Services. Selected institutions demonstrate extraordinary and innovative approaches to public service, exceeding the expected levels of community outreach. The University Libraries -- just the third academic library to win the award in 23 years -- is a trailblazing service provider and problem solver for a diverse and extraordinary number of communities. The Libraries develops and supports traditional and innovative services, collections, and partnerships engaging the University's faculty, staff, and students in the pursuit of knowledge. As the state's only research library, it reaches well beyond campus borders to develop and deliver high-demand services and programs to all 5.5 million Minnesota residents. Its archives and special collections serve several distinct, off-campus communities. And, with a foremost goal of equitable and open access, the Libraries shares its rich resources with a global audience. Minnesota has a lot to be proud of in its various array of library services and contributions to its citizens. Download this free 2018 calendar promoting Minnesota's library services. 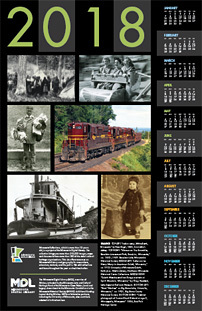 Or order calendar and other promotional materials from MNLINK.